Close-up of traditional Métis beadwork. The Métis are heirs to a vibrant culture of decorative arts that emphasizes the brightly coloured floral motif in beadwork and embroidery. The Dakota and the Cree, in fact, referred to the Métis as the “Flower Beadwork People” because of the preponderance of flower designs in their beadwork and embroidery. Early 19th-century European and Euro-North American observers and travellers also made constant reference to the decorative beadwork on Métis clothing. Over time, floral beadwork has become one of the most distinctive Métis symbols. The Métis developed beautiful beadwork patterns that combined First Nations beadwork with the floral embroidered patterns introduced by French-Canadian nuns working in the Roman Catholic missions. By the 1830s, increasingly naturalistic and colourful floral designs became evident on Métis products from the Red River region. Beadwork was found on almost every item of traditional Métis clothing and functional hide and cloth work. The glass beads they used were procured from the trading companies. Beaded clothes included moccasins, coats, vests, belts, bags and mittens. Beadwork was also done on tablecloths, wall pockets and cloth frames for religious pictures. Beaded creations were, and still are, an important source of income for many Métis women and families. Generations of Métis women have produced countless objets d’art for loved ones and for sale. Many contemporary Métis artisans, such as Lisa Shepherd and Jennine Krauchi, continue to bead pieces such as moccasins, coats and mittens that are housed in museum collections across the Métis Nation Homeland. Traditional Métis beading has continued to develop thanks to a great deal of community interest and effort. Métis organizations such as the Louis Riel Institute and the Gabriel Dumont Institute regularly hold beading workshops and have produced beading resources. Many talented beadwork artisans also teach this art form to interested community members. Traditional Métis sash from the 19th century. The variety of sash worn by the Métis, known in French as ceinture fléchée (sayncheur flayshii in Michif) or “arrow belt,” was originally crafted around 1870 by French-Canadian artisans in the village of L’Assomption northeast of Montreal. Later, the Haudenosaunee (Iroquois) began to manufacture this fur trade staple as it gained popularity throughout North America. The sash was brought to what is now Western Canada by French-Canadian voyageurs and, to a lesser extent, Haudenosaunee and Anishinabeg (Algonquin) voyageurs working with the North West Company. 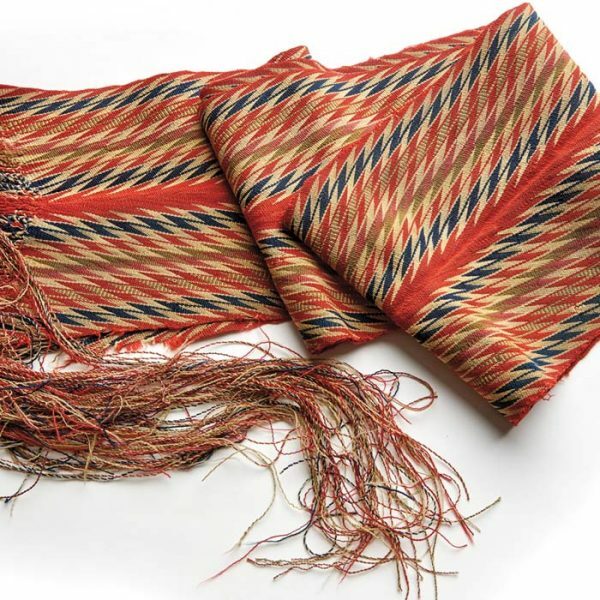 This first sash was based on First Nations finger-weaving techniques and European design and raw materials. As First Nations and Métis women gained access to wool from both Hudson’s Bay Company and the NWC, they began to make sashes in distinctive colours and patterns. For the Métis, the sash was more than a decorative piece of clothing. It could be used as a rope to pull canoes over portages or to harness heavy loads on the backs of the men and women who unloaded freight canoes and York boats. It could even be used as a dog harness. The Métis used the sashes’ fringed edges as an emergency sewing kit, and the sash could carry personal effects such as medicine, tobacco, a pipe or a first aid kit. It could also be used as a towel or washcloth, and during winter, it could keep a capote (hooded jacket) fastened to its wearer. Today, most sashes are made by machines. The finger-woven sashes are usually of higher quality than the machine-woven ones, but are rare and expensive. The art form of sash finger weaving is now being revived and taught to young people. The capote is a hooded jacket that was made from a woollen Hudson’s Bay Company point blanket. Around 1780, the HBC point blanket became a regular inland trade item. Sold in pairs, each blanket was graded by weight and size using a “point” system. The number of indigo lines woven into each blanket’s corner identified the number of points and could be found easily without unfolding the blanket. Capotes are lightweight and warm. Traditionally worn only by men, these coats were made wider at the bottom to allow for greater mobility for those who worked in the fur trade. The capotes were almost always fastened with a sash. These coats became so popular that each group of fur traders adopted a specific colour to represent themselves. The North West Company chose blue, while HBC chose red as their main colour. First Nations and French-Canadians also wore capotes. Today, both Métis women and men make and wear capotes. Capote-making workshops are held across North America. 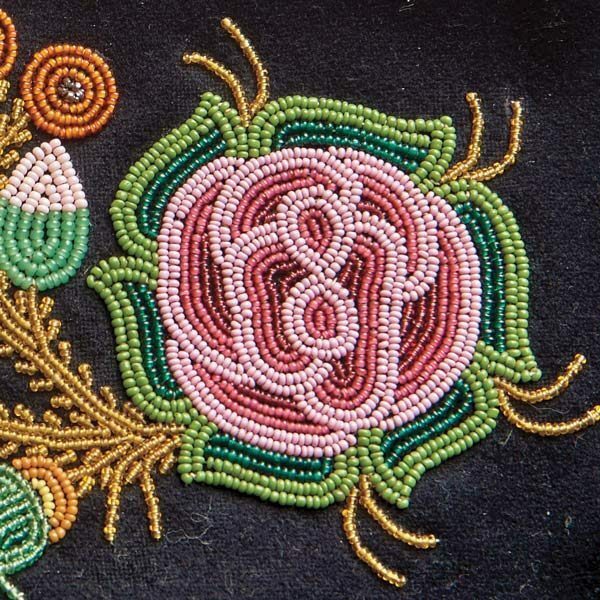 Over time, floral beadwork has become one of the most distinctive Métis symbols. These elbow-length gloves are made of animal hide and are often decorated with beads, quillwork or embroidery. In the past, Métis women made gauntlets but only men wore them. It was important for each pair of gauntlets to be unique, because hunters used them to identify the animals they killed while hunting bison. As soon as an animal was shot, the hunter would drop his gauntlet beside it before continuing on the hunt. This tactic was used to keep track of who shot which bison during the confusion of the hunt. After the bison were killed, the women looked to see whose gauntlets were lying beside each animal. They would only start skinning and butchering an animal that was beside their husband’s gauntlets. The meat was usually shared with others in the community. Today, Métis continue to make and wear gauntlets. Much like beadwork, embroidery was prevalent on clothing, as well as on personal and household items throughout the regions in which the Métis travelled and lived. A common motif is the floral pattern, which exists in a relatively narrow spectrum of colours. The flower designs are a carry-over from the time prior to the 1850s when women used quills in their embroidery. Flowers are usually embroidered in shades of pink through red, with the buds in shades of blues and purples. The flowers’ centres are white or dark yellow, and the leaves are green. A three-dimensional effect is produced with a combination of layering. An introduction to the European techniques of silk embroidery was provided in Catholic mission schools in the 1830s at Red River. Once the Métis girls were outside the nuns’ influence, they experimented with various styles and decorations, developing their own unique artistic tradition. Embroidery appears on both functional and decorative items such as mittens, jackets, leggings, moccasins, vests, knife sheaths, bags, dog blankets, wall pockets, pillowcases, piano covers, picture frames and purses. The tradition of embroidery remains alive today, though silk is commonly replaced with cotton and rayon floss or thicker wool and synthetic yarns. 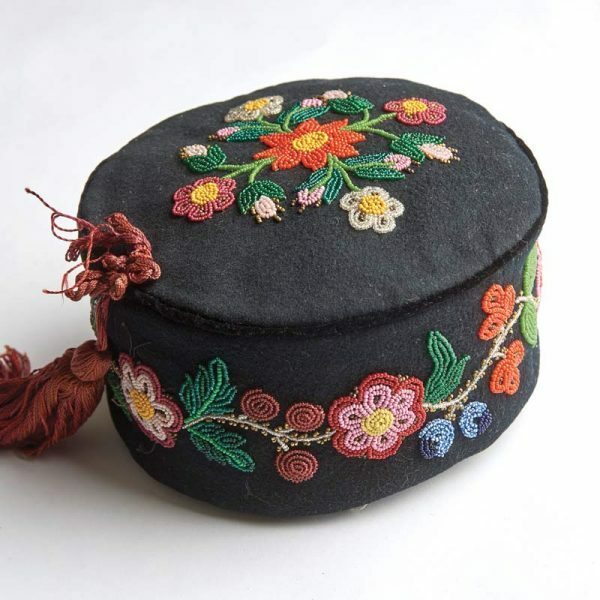 Embroidered items have long been popular items in the tourist trade, but many are still produced as gifts for friends as well as for personal use and adornment. In fact, among the Métis in the Subarctic, women have long made embroidered mitts and moccasins to give to husbands and male kin as special New Year’s presents.